You showed your small, slight form to mother Sita, assuming a terrible form you burnt the city of Lanka. When Hanuman was in front of Sita for the first time, he took on a very small, child-like form. When he first discovered Sita in the Asoka vaatika gardens, she looked very emaciated and weak from the ordeal she was going through. Approaching her in his large mighty form would have scared and distressed her. 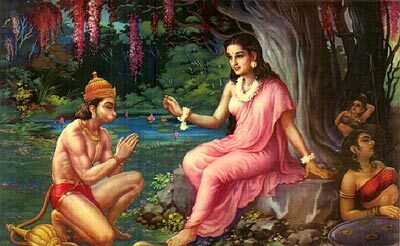 Initially Hanuman dropped Rama’s ring in front of her, and started singing Rama’s glory to comfort her and so that she would believe that he was a genuine friend as opposed to a servant of Ravana trying to play a trick on her. Only after this did Hanuman appear in front of Sita. Hanuman’s actions were sensible. He always thinks before he acts (unlike the common tendency of people to often act first and think of the consequences of our actions after). His actions ensured that Sita would know that he was a genuine friend of Rama. Also, it is said that no matter how great and powerful we become, the wise person (like Hanuman) will always be childlike and humble in front of our parents, gurus and other very virtuous persons. On a yogic or mystical interpretation, Sita is the power and grace of nature/creation. When approached with humility and sincerity we are granted the blessings and secrets of creation. When approached with brashness, ego and ferocity the blessings are withheld from us. By contrast, when Hanuman confronted the raakshasa servants of Ravana and burnt the city of Lanka, he took a large, might and awesome form. This teaches that people should stand up and be fierce when it comes to confronting negativity and evil, but be humble and kind to others. The modern day cowardly tendency is the exact opposite of the ideal set forth here. So many of us act fierce and arrogant in front of those we should be humble towards, and we act meek and mild in front of those we should stand up and be fierce against. For example, it is unfortunate to see many people be rude to their parents and yet humble and mild to their bullying boss. When it comes to confronting evil or to making a positive change in the world against the myriad of problems, the average person makes excuses like “What can I do? It’s not my battle to fight”. WRONG! This is the time to stand up and be fierce and dare to change things. On an inward mystical level, the message is that we should be ruthless and brutal in weeding out and confronting the demons within our own hearts. The golden city of Lanka which Hanuman burnt represents illusory values and attachments, which Hanuman like qualities help us burn up (overcome). All of this was only to “fulfil the mission of Lord Rama”. Hanuman didn’t show of his strength, power, courage and ferocity to impress people and gain personal prestige and power. He would exhibit these aspects of his personality for a divine cause only, for the cause of Lord Rama. Likewise – when we are called upon to evoke and bring forth our courage and power, it should not be for any ulterior motive other than for a cause we believe in with our head and our heart to be a divine cause. A divine cause is one that will contribute to eventual lasting peace, harmony and dharma. Great article and excellent explanation. These words just some up the problem with some of the members of our current generation.